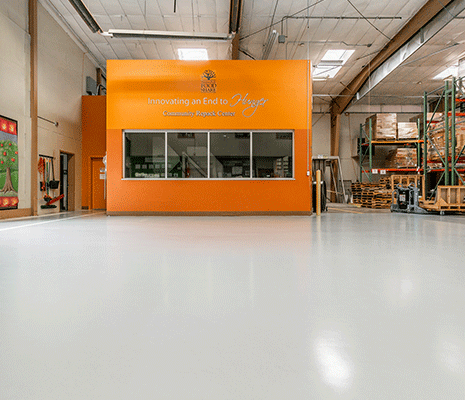 Marion-Polk Food Share was looking for a durable, food-safe floor that would protect the concrete substrate, clean easily, withstand high traffic and improve the overall look of the warehouse. 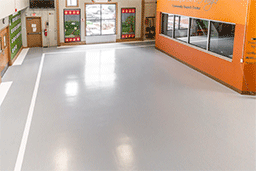 Tennant’s Eco-RCE™, Eco-RCE™/M and Eco-HTS™ 100 topcoat system, in a light gray color, was the perfect and affordable solution for their situation. In addition, white line striping was added to designate both walking and working areas while simultaneously providing visual appeal. 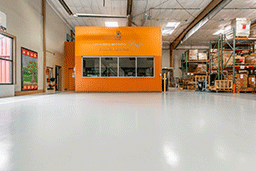 Initially Tennant’s Eco-RCE (Rapid Cure Epoxy) is applied as a primer. Then a coat of Eco-RCE/M, pigmented with light gray colorant, is applied as the build coat. 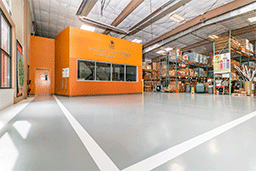 Eco-HTS 100, also pigmented, is applied as the final topcoat. Eco-HTS 100 was chosen for multiple purposes. 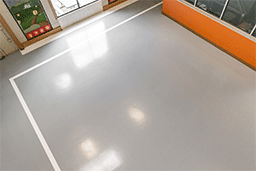 The aluminum oxide in the Eco-HTS 100 not only helps provide a light texture to help aid against slip and fall incidents but it also helps provide extra wearability in high traffic areas.